The former girlfriend of the Soham murderer Ian Huntley has been transferred to a Derbyshire jail. After an appearance at Peterborough Magistrate' Court on Friday, Maxine Carr was taken to Foston Hall prison in South Derbyshire. The 27-year-old faces a total of 20 charges relating to claims for various benefits and job applications. She is currently serving a three-year sentence for conspiring with Huntley to pervert the course of justice. 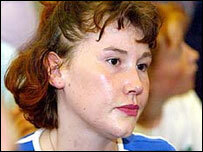 She will next appear at Peterborough Crown Court on 23 April. The new jail, which is between Derby and Uttoxeter, holds 235 women inmates. Unlike men's prisons, women's jails do not have security classifications apart from "open" or "closed". Foston Hall is "closed" but is considered less harsh than the notorious Holloway in north London. The Prisons Handbook says of Carr's new jail: "There are extensive grounds and good opportunities for access to fresh air." Prison sources said the move from Holloway to Foston Hall was a "progressive" one which would give an inmate better access to offending behaviour courses, education and work.